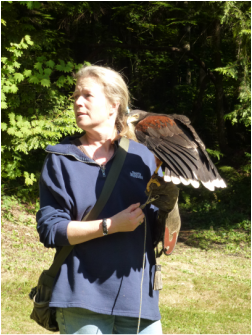 Experience an hour in the company of Birds of Prey. Your experience starts with a tour of our facility, introduced to many of the Raptors we have. Basic instructions on handling Birds of Prey, you are then introduced to the Raptor you will be handling. With the basic knowledge of handling the Raptor, you are ready for a walk through our Native West Coast Rain Forest with fern laden floor and meandering creek, with the Raptor on your fist. No animals, no spectators, no exceptions.